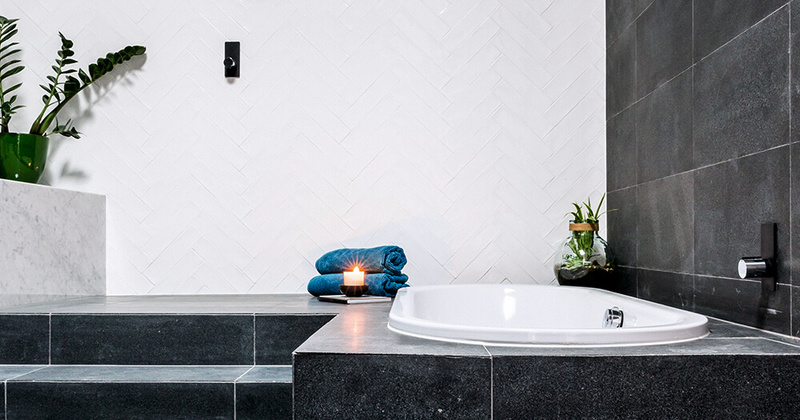 Renovating a bathroom can be a big investment, largely because the job is so trade dependent, which I think is why house hunters place significant emphasis on bathrooms being up to scratch, writes Carlene Duffy. Even budget bathroom makeovers can be costly but there are a few ways to update your bathroom without renovating or engaging trades at all. No, you won’t achieve the bathroom of your dreams but you will achieve a fresh and improved space that may be all you need for resale or for your own enjoyment. Yes, it is true, there is a paint product on the market designed specifically for painting wall tiles. My parents in law recently used it to update their bathroom before putting their house on the market and I was really impressed with the transformation. They painted over daggy brown tiles straight out of the 70’s that were making the bathroom appear a little bit depressing. Opting for a simple white tile paint they were able to revitalise and freshen the bathroom without the cost of a tiler, a cost they probably wouldn’t have made back come sale time. Be sure to follow the preparation instructions for the ultimate result. Unfortunately, there isn’t anything on the market yet for painting floor tiles because floor tiles are subject to the sort of wear and tear that paint can’t withstand. But I’m going to keep my eye out because it’s only a matter of time. Similarly to the tile paint, at your local hardware retailer you can pick up paint specifically designed for coating baths and shower recesses, which is very good news for old, sad looking bathrooms. 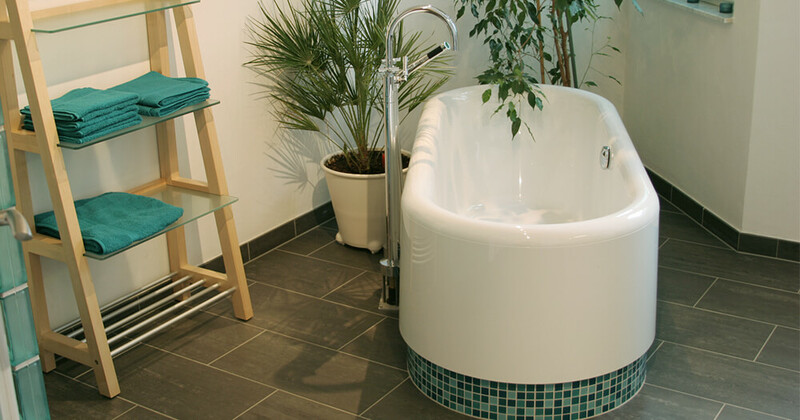 Old baths and shower recesses can discolour, scratch and stain over time and the cost in not having to replace these items can be significant. I suggest doing some googling of the product in use, so that you can see what it does before you buy it. The cost it will save you means it’s certainly worth considering. If your bathroom is feeling a bit lacklustre and you aren’t in a position to overhaul it, do a thorough search of some beautiful and high impact towels to steal the focus of your space. There are some beautiful bath towels on the market at the moment in some really vibrant colours, interesting weaves and striking patterns. Moroccan-inspired towels are especially popular and rightly so - they inject some much needed vitality and character into a bathroom. It might be that you’re sick of your clinical white bathroom and simply need some interesting accessories. It’s certainly more cost-effective than retiling. In fairness, this takes a handy relative or friend but we all have one of those we can call on in times of ‘home fix-up’ need. Including timber in a bathroom is effective at creating warmth and softness as bathrooms can otherwise often be cold and clinical interior spaces. The bonus of including timber in the form of shelving is that they are so functional for storing bathroom items that you access frequently. Of course, these items should be well considered if they are to be on display all the time. 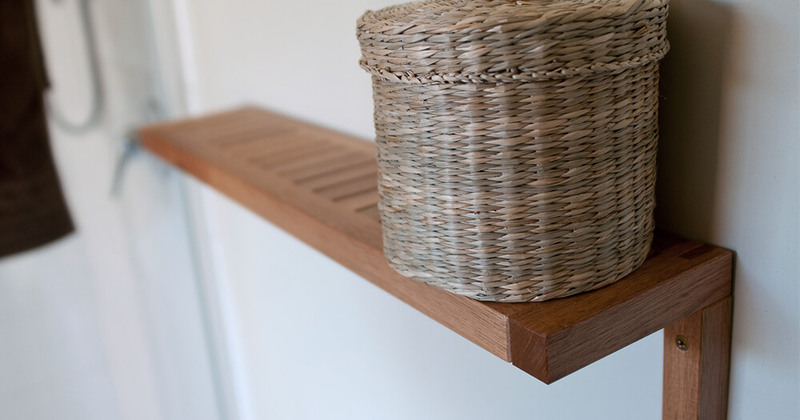 There are a few homeware retailers that sell timber shelves ready-made if you don’t want to bother with custom made. I might add here, be sure that your handy friend or relative uses the right kind of brackets on your floating shelves because there is nothing pretty or practical about sagging shelves. And be sure to seal the timber to prevent mould appearing. Bathrooms are humid spaces and mould loves natural materials such as timber. The addition of plants in any space of the home adds life and a sense of energy. 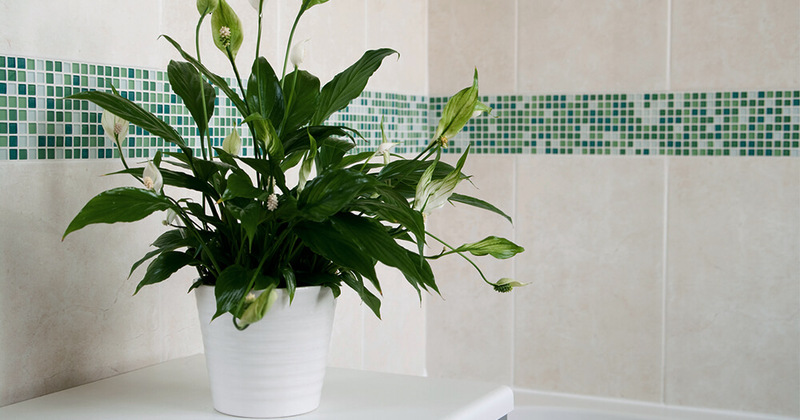 But more than in any other space in the home, plants are key in the success of the bathroom because bathrooms are such hard-surfaced areas that otherwise provide little opportunity to add warmth. Plants also effectively add colour into our home interiors without competing with other colours, which is good news if you already have a lot of colour going on. Whether it’s a small plant on the vanity, a floor plant for the corner, or a cascading hanging plant, even in the smallest bathroom, there is always room for plants. I would sit one atop that timber shelf you install. It’s another paint product but this time for painting over tired cabinet doors. If you’re current bathroom cabinet doors are timber you have the freedom to use a pretty standard paint as recommended by your paint supplier. What’s more exciting about the interior design and renovation sphere is that you can also now purchase paint specifically designed for painting over laminate and melamine and if you have ever received a quote from a cabinet maker for new cabinets you’d know how valuable this product is. Here again, be sure to follow the product instructions in order to achieve the best result. If your bathroom mirror is looking anything like mine is at the moment, it might be rusting and deteriorating around the edges and contributing to the demise of your bathroom. 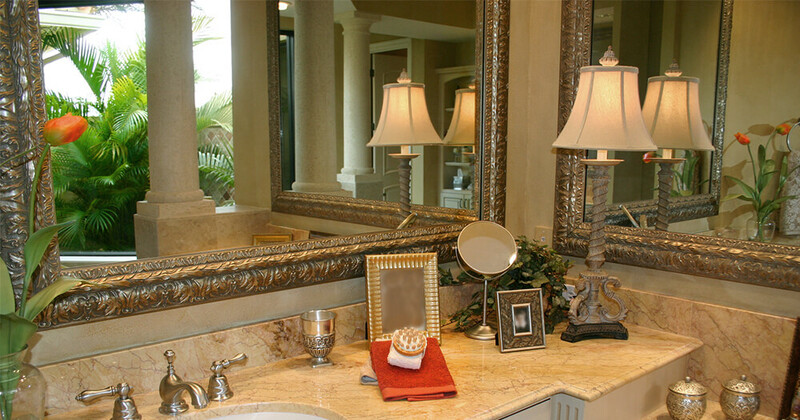 The good news is that you can purchase ready-cut, frameless mirrors from your large hardware stores in a good range of sizes. Otherwise look at mirror retailers and homeware retailers to find a beautifully framed mirror in a clean-lined aluminium or timber or something more elaborate if the space requires it. It might be the pick-me-up your bathroom needs. Again, you might need to call on that handy friend or relative to help you install it. Obviously if the budget allows, your most impactful and successful bathroom makeover is going to be to replace the tiles, design and install a new vanity and bring in all new tapware, accessories and lighting. The reality is that not everyone is in a position to replace the old for the new, as you would need to budget for plumbers, tilers, cabinet makers, and electricians on top of the cost of materials. If your bathroom functions well but simply needs some aesthetic love, consider a very superficial, inexpensive makeover to make the most of the space with the least amount of money even if it simply buys you time. Enjoying Carlene's interior tips? Read more expert advice from some of Australia's leading Interior Designers here.